How to Make a Fresh Apple Juice Delicious Deals How to make apple juice is easy and can be done at home. Not having to buy apple juice in containers. 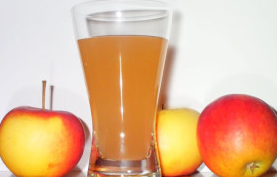 Apple juice can also be combined with a variety of fruits. But in this article will be discussed is to make apple juice without any combination. Even so sure they stay healthy and delicious. Everyone would have known apple. In addition to direct consumption of apples can also be processed into various foods or beverages. For example is the apple juice. Apples used to make apple juice-free kind. Can green, red and others. Green apple usually more acidic. While red sweeter. Selection of apples are used depending on your taste. For those who are curious, here's how to make apple juice. Choose fresh apples for processing into juice. Do not forget to wash the apples first. Apple split into several pieces and then blend until smooth. If you still want to feel the pieces of apple, then do not blend until smooth. Do not forget to add the sugar and water into a blender. You can also add ice cubes that can apple juice tasted fresher. If it is smooth and well mixed, serve apple juice in the glass. You can also add additional fruits, such as pineapple and banana. Currently the combined fruit juice has become a trend of healthy lifestyle. Apple juice can be enjoyed anytime. Some people replace dinner or breakfast with fruit juice. Apple juice can be one of your alternatives. If you want to lose weight, it should be served apple juice with no added sugar at all. In addition to fruits, can also be combined well with vegetables. For example, such as spinach or carrots. The apple juice combination of vegetables can be an alternative way parents give to their children vegetables that are difficult to eat vegetables. Usually the vegetables will be covered with apple flavor. Surely healthy and whole range of benefits can be obtained. So how to create a healthy apple juice. 0 Komentar Untuk "How to Make a Fresh Apple Juice Delicious Deals"